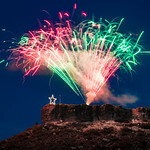 80th Annual Castle Rock Starlighting is presented by the Castle Rock Chamber of Commerce and Sponsored by Castle Rock Bank. Nearly 20,000 people were in attendance. Thank you to Versatility Creative Group for capturing the moment!